Instead of closing May 31, Demon's Souls servers will stay up indefinitely. Unlike its main character, Demon's Souls is not ready to die just yet. Although Atlus initially stated that the innovative online mode for its super-hard action-RPG would go down forever on May 31, 2012, the company has decided to stay its end indefinitely. This does not mean that the game will remain online permanently, but gamers who want to check out or revisit the cursed kingdom of Bolateria can take a deep breath and take their time instead of rushing through it in the next six days. A press release from Atlus states that "the servers will now continue to operate for the foreseeable future." Long-time Bolaterian demon hunters will see this as good news, but the move seems equally aimed towards new players who have not yet been brutalized by the critically praised 2009 game. 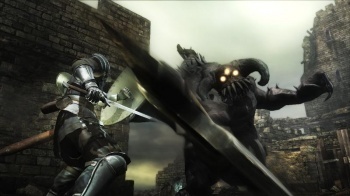 "While it originally seemed as though it would be unfeasible for us to continue to sustain the servers, a number of developments have made it possible for us to continue to invest in and support our fans as they have continued to invest in and support us and Demon's Souls," says Tim Pivnicny, vice president of sales and marketing at Atlus. "For all the gamers who have yet to discover the game's amazing online experience, we're happy to say you can still log on and find out why Demon's Souls is still regarded by many as one of the finest games of all time." This is actually the second time that Demon's Souls has been spared from an eternity in offline mode. Speaking as someone who only started playing recently and had actually been rushing through to finish by May 31, this is great news. If the prospect of playing one of the harder PS3 games out there has you scared, don't be; all Demon's Souls asks to succeed is skill and patience, and now you've got lots of time to develop both.